Many entrepreneurs do diligent market research. They study their current and potential customers, do user persona exercises with their team, and analyze market trends. Indeed, these steps are critical to validating an idea, getting traction, and scaling. However, this kind of market research alone is not enough. Equally diligent ecosystem mapping is also needed to ensure success. Who else is working to solve the same problem or leverage the same opportunity? What are their solutions and innovations? What’s working well, what’s not working, and where are the gaps in the system? 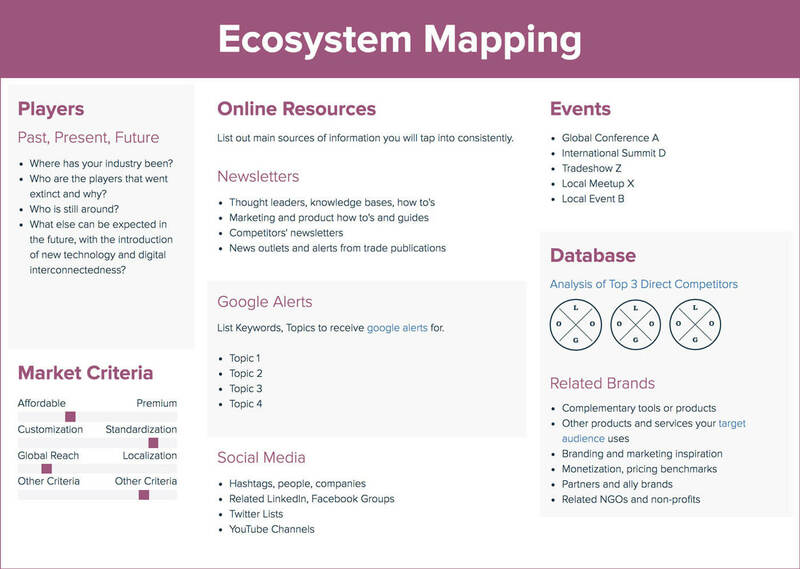 Ecosystem mapping — also called landscape research, competitive scan, or a number of other related terms — involves a deep dive over a sustained period of time to understand the established and emerging competition. In traditional business, this expertise allows a social entrepreneur to be better or different (think SWOT analysis). In social impact work, it allows an entrepreneur to understand where holes exist and what pain points are not currently being addressed by other mission-driven organizations (think gap analysis and theory of change). This probably goes without saying, but ecosystem mapping requires more than a Google search. It requires more than an X-Y axis with six competitor logos on it. Sure, it’s tempting to look up “learn to code apps for 4th graders,” click on the first dozen links, and call it a day. But if you’re trying to launch a successful venture, it is well worth your effort to do much more than that. Keep a database. A simple iPhone note or Google Sheet can serve as a handy catalog for future reference. When you start learning about your competitor companies or complementary organizations, add them to a list, and grow that list rapidly during the first phase of your research. Include entities that no longer exist, so you can vicariously learn lessons from their failures or exits. Once you notice that you’re encountering the same names over and over, even with nuanced and diverse research techniques, you can stop digging…for now, at least. Make a visual of some kind. When you learn about competitor companies or complementary organizations, pin, post, or write them onto a “map” that makes sense for your work. Maybe you have a venn diagram with circles for non-profits, for-profits, and government organizations. Maybe you have concentric circles with your closest competitors in the inner circle and potential partners outside. Or maybe you have a wall with post-its color coded by size of organization. Regardless of what your map looks like, it will help you contextualize the field in which you work. Sign up for e-newsletters. When you identify organizations that most closely resemble yours, sign up for their newsletters. There’s no better way to hear about their latest news and progress than having it delivered directly into your inbox. Create a Twitter list. Put companies, thought leaders, policymakers, and funders from your ecosystem into a Twitter list, and set yourself a calendar reminder to scroll through that feed once per week. Go to conferences and trade shows. Talk to people who do the same kind of work as you. Play the name game — who do they know that you do not, and vice versa. Be curious. If you read a news headline that tangentially relates to your work, click through and read the entire article. Sometimes, journalists will find previously unknown innovators, and you don’t want to miss that scoop. Set up Google alerts. We probably all know we can do this, but few of us do. You should. The bottom line is: If you want to succeed, become an expert in your field and all of its players — past, present, and future. You’ll know who you aspire to be like, who you want to beat, and where the gaps in the ecosystem exist and are waiting to be filled. Do you have other tactics for ecosystem mapping? Share them, and we will add them to this list! Makaela Kingsley is Director of the Patricelli Center for Social Entrepreneurship at Wesleyan University in Middletown, Connecticut. She teaches project-based, experiential-learning courses for student entrepreneurs, intrapreneurs, and changemakers. A 1998 graduate of Wesleyan, Makaela previously held positions in Wesleyan’s advancement division focused on alumni relations, volunteer management, and event planning. She began her career at the Planned Parenthood League of Massachusetts where she worked in development and public relations. Outside of the Patricelli Center, Makaela volunteers on the Advisory Board of Open Communities Alliance, as a Coach for AshokaU’s Commons, as a mentor for the Yale Entrepreneurial Institute, and as a judge for Echoing Green. She lives in Hamden, CT, with her husband and two children.